I made very good progress again today and it was clear that I’d arrive well ahead of target if I continued at that rate. So I extended today’s ride by about 32 miles to take in both the signed NCR1 and a traffic-free cycle route along the path of a former railway. The latter is more direct than the on-road route, but it’s quite bumpy so hasn’t been adopted as NCR1 for the moment. There’s definately potential there though if the surface can be improved. Several miles further south, in what will be tomorrow’s cycling, NCR1 resumes using the railway path, which leads into Aberdeen. As if to emphasise the uneven distribution of the mileposts that I mentioned yesterday I didn’t see a single one today, even though a sizable chunk of today’s journey was on NCR1. I saw plenty birds of prey today, but only at a distance or short moments nearby, so unfortunately haven’t had an opportunity to get any better photos than the other day. They certainly have impressive wingspans and fly so gracefully. 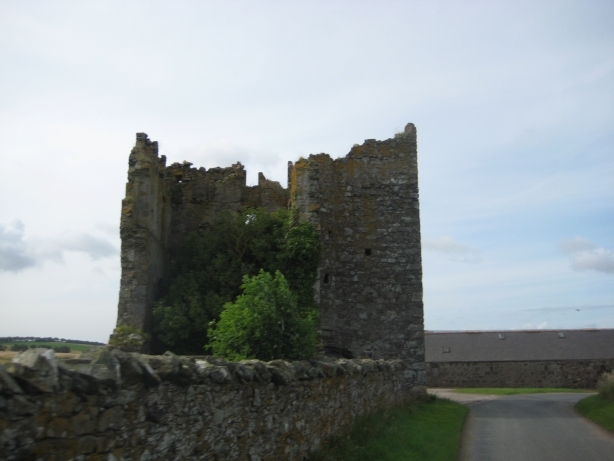 Today’s route also took me close to a few ruined castles, including one immediately adjacent to the route. I also saw a monument on a hill, but until I glanced down a my map and saw it marked as a monument I thought it just looked much more like a large water tower. The weather’s been playing it’s part well again. It was generally pretty good today with some nice sunny spells. The showers, when the occurred, were light and hardly warranted donning waterproofs (Indeed on more than one occasion the rain had finished by the time I pulled over and put my jacket on.). This entry was posted on Thursday, July 30th, 2009 at 20:10 and is filed under Cycling. You can follow any responses to this entry through the RSS 2.0 feed. You can leave a response, or trackback from your own site.